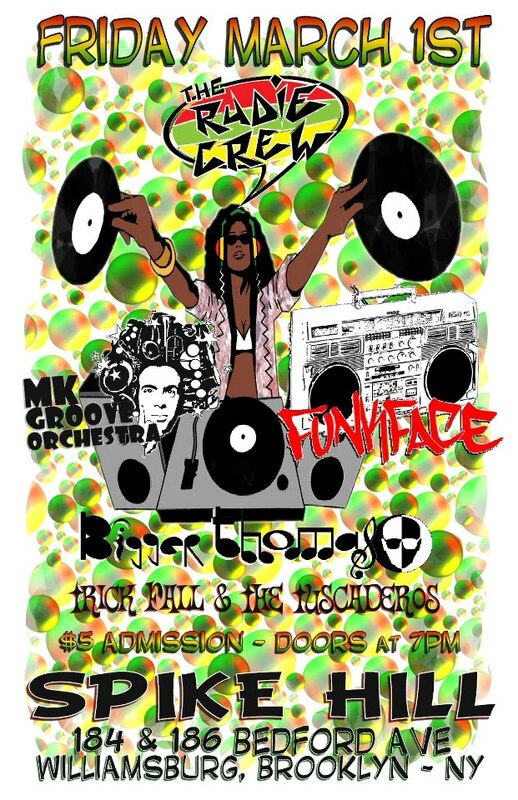 Electric Avenue presents Beat Brigade, Across the Aisle, and the debut of Rude Boy George! Adventures in Ska Crowd Funding: The Scotch Bonnets! Over the weekend, the postman (remember those nice men and women that bring letters and packages to your home that some people want to put out of business?) 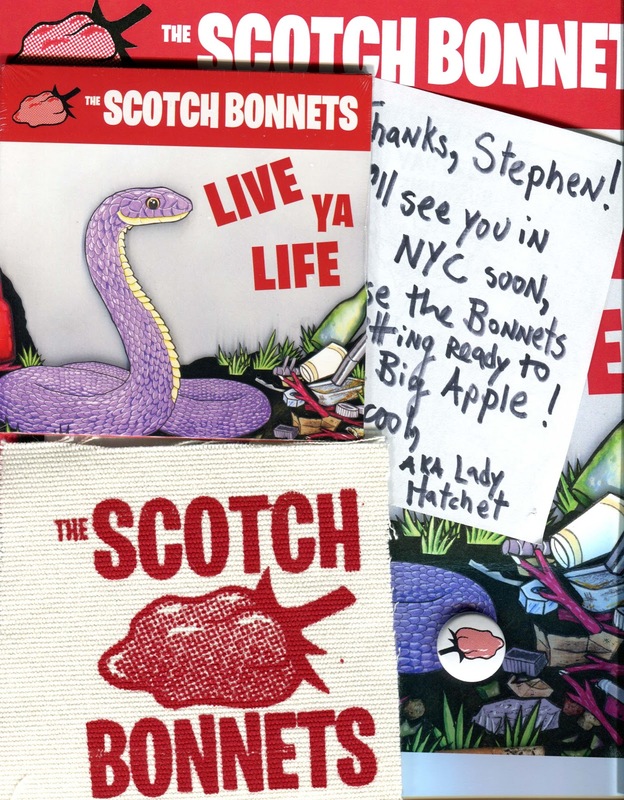 delivered a manila envelope of goodies to me from Baltimore's top ska/rocksteady/soul act The Scotch Bonnets. You see, last summer, I had supported the band's Kickstarter campaign and it's now time for me (and all of their other backers) to enjoy the fruits of our collective investment in the group: their new, debut Live Ya Life CD, a patch, a badge, a poster, and a nice thank you note from Lady Hatchet, to boot! The deal is that 65 of us had some faith in the band, put up a little bit of cash, and all of us now have a terrific album to enjoy and/or some cool merch--and in the process, The Scotch Bonnets debut album can now be sold at shows, so they can earn a bit more money to keep themselves going and making the music we love. Plus the album helps spread the word about the band--and can help lead them to even bigger and better things. A good way to think about all of these ska crowd funding projects (apart from our selfish motives--namely that we get a CD or vinyl or merch out of it all!) is that they help give bands a leg up. In a way, we the fans are replacing all of those pre-filesharing indie labels that would take big risks on new and unknown bands by fronting the cash to put out their albums; and instead seeing monetary profits that might come if a band takes off, our reward is that we're helping these bands to continue to be in position to keep on creating the music we love (and since making music is--in most instances--a money-losing enterprise, we have to do what we can to support their labor of musical love, too). Hot on the heels of Sammy Kay's debut EP (read The Duff Guide to Ska review here), comes this project to fund his new 15-track album of bluesy, soulful, rocksteady and ska cuts titled Love Letters. Levels of support range from $8 for digital copies of Love Letters and his recently released EP, to $12 for the CD or $15 for black wax, to $30 for both CD and colored vinyl of the album (plus stickers and pins), and higher. Pledge your support here. Right now, the $3,200 goal has been reached (and then some), with 3 more days to go. Urban Pirate Records is hoping to put out a series of split singles from some of the finest ska and early reggae artists playing out right now on the US scene. What's cool is that you can order singles a la carte (for $7 each) or go for the whole enchilada ($30 for all five singles); higher amounts score you test pressings and other goodies. Pledge your support here. To date, the Urban Pirate Booty Split single series has raised a little over the $5k needed to fund this project, with 4 more days left. w/Uzuhi (PMA infused NYC punk rock), The Pandemics, and more TBA! 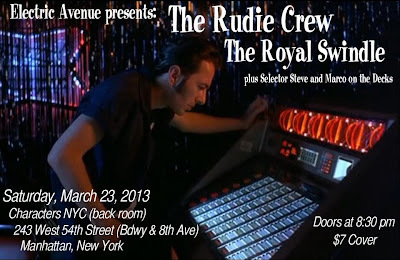 Duff Gig Review: The Reggay Lords and The Copacetics at Electric Avenue on 2/23/13! The day before our event, Electric Avenue's start time had to be pushed back a bit, as the pub booked a last-minute party in their back room for a guy whose fiance broke off their engagement the weekend of their wedding! (Since he had all of his friends in town anyway, they decided to have a condolence party of sorts.) I set up my DJ equipment and started spinning some ska tracks during the last hour of their event (was it too cheeky of me to kick off my set with The Beat's cover of "Tears of a Clown"?! ), and a bunch of the ex-groom-to-be's guests hung out for part, if not all, of the night's performances. Since we had some extra time to hang around, Marc and I spent some time with Larry, one of the afternoon barkeeps who grew up in Ireland and went to shows by just about every punk and post-punk band that I was listening to on WLIR when I was a teenager lost in Yonkers in the first half of the 1980s. Over a few beers, he told us stories from the times he saw The Undertones, The Jam, Bob Marley, Secret Affair, The Buzzcocks, The Ruts, The Clash, Joe Strummer, The Tom Robinson B and and more, as well as music-related tales from the football terraces and city streets, where daring to be different was an open invitation to all for a beating from cops and fellow citizens alike. Every time I talk with Larry, I learn something new about some of my favorite bands. So, if you're ever at Characters when he's behind the bar, make sure to ask him about your favorite post-punk act and be prepared to be schooled by a man who experienced it all first-hand. While it's highly entertaining just to witness The Reggay Lords performing in powdered wigs, puffy shirts, velvet robes, and masks (facetiously condescending to us "commoners," like they are out of King Louis XVI's court--read my Duff Guide to Ska interview with Lord Point for a taste)--you might be tempted to dismiss their act as shtick. Led by vocalist Lord Point--who somehow managed to hold onto his giant goblet brimming with Guinness for the majority of their set--The Reggay Lords played most of the songs off their stellar debut album--about chasing good times; being able to get what you want; battling for power in a relationship; women who do you bad; how money won't fix all problems; throwing off one's oppressors; questioning the real meaning of freedom; and an anti-Pope diatribe--plus a few others (notably, "Stereo On," which is about the simple joys of listening to music and how it makes live worth living, is a new absolutely favorite cut of mine). Their set and performances were spot-on fantastic (doubters can screen the videos I shot below) and I'm definitely eager to see 'em again soon! 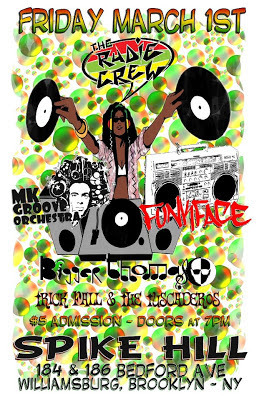 Ska, rocksteady, and reggae fans should be mad scrambling to see them and picking up their ($6!) digital album. Do your part! While people are beginning to hype what they are calling the "fourth wave" of ska (though ironically enough this seems to be based on the considerable nostalgic enthusiasm for reformed ska bands popular in the 1990s--not that there's anything wrong with loving these bands; in fact, there's a lot to love! ), many of the acts, both new and old, that have been keeping the scene going--continually playing gigs on the underground and releasing vital new music during the 2000s and beyond--very much deserve fans' interest and support. (I'm always psyched to learn about great new bands/releases!) They've been the ones taking on the chin during the lean years, so please consider making that extra effort to show up to at least a few gigs each month (remember when seeing bands play live was fun--well, it still is! Why else do you think I help organize the Electric Avenue nights for free?) and spending the ridiculously little amount of cash on buying a digital download, CD, or LP (the price of buying recorded music is generally cheaper than it was in the 1990s!). If there is going to be a sustainable "fourth wave" (can't we think of a better name with which to brand it?! ), it can't be built on nostalgia alone. So, dig deeper. You'll find all sorts of fantastic new bands and releases to feast on! The Next Electric Avenue Ska Night: The Rudie Crew and The Royal Swindle on 3/23! 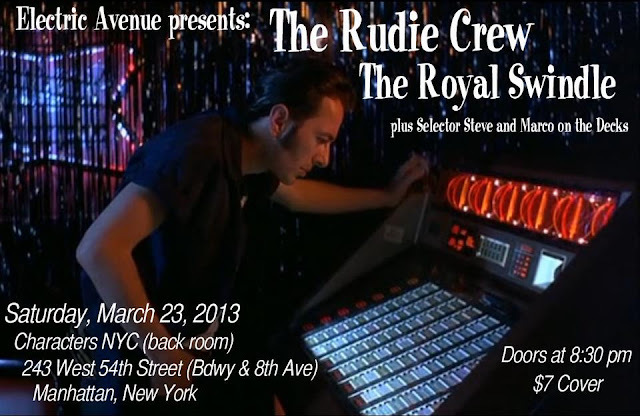 Tokyo Ska Paradise Orchestra Ticket Contest for Their NYC Show on 4/28/13! If you live anywhere near the NYC metro area and want a chance to win tickets to see the mind-blowing Tokyo Ska Paradise Orchestra at Stage 48 in Manhattan on Sunday, April 28, 2013--then we have the contest for you! Thanks to the Tokyo Ska Paradise Orchestra and the good folks at Stage 48 and The Press House, The Duff Guide to Ska has 10 pairs of tickets to give away through our Skapara contest! 1) Answer the following question: What was the name of the first Tokyo Ska Paradise Orchestra album to be released on a German record label--and what was the name of that imprint? 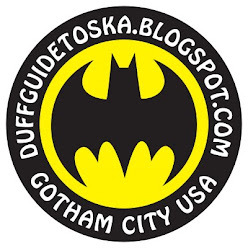 2) Submit your answer to duffguidetoska@gmail.com by 5:00 pm on Friday, April 19, 2013. Ten winners will be selected at random--and will be notified by me via email on Saturday, April 20, 2013. Good luck to all contest entrants! "I'd make time for Tokyo Ska Paradise Orchestra anytime," said no less an authority than the band's one-time producer, veteran reggae guitarist Dennis Bovell. Starting out in the late '80s as a ska revival group playing the streets and clubs of their hometown, the sharply suited Tokyo Ska Paradise Orchestra quickly became the flag-bearers for the Japanese ska scene. This movement gained popularity in the 1990s and included the arguably more "authentic" ska sounds of the Ska Flames (signed to Gaz Mayall's label in the U.K.) and the Determinations from Osaka. Like those two acts, Tokyo Ska Paradise Orchestra's sound is largely instrumental, with powerful, punchy arrangements that re-create the jump-up energy of Jamaican ska originals such as the Skatalites. It's a sound as vibrant as any modern-day ska -- anywhere. Over the course of more than 1,000 live shows, the band has forged a live reputation that has seen it invited to perform at England's Glastonbury Festival and France's Eurockeennes. Redefining their sound over the course of more than ten albums (including the occasional European release), the deaths of two bandmembers, and the departure of their bandleader, Asa-Chang, the ten-man-strong Tokyo Ska Paradise Orchestra have also recorded with some of the biggest names in Japanese music, including Shiina Ringo, Puffy AmiYumi, and Thee Michelle Gun Elephant's Yusuke Chiba. They've also played at different times with singer Neville Staples and trombonist Rico Rodriguez, both former members of the Specials. Formed in 1985 by percussionist Asa-Chang, Tokyo Ska Paradise Orchestra quickly gained popularity. 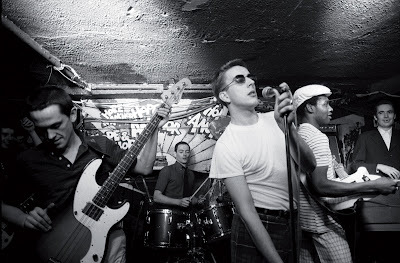 Within two years of their debut release -- an eponymous 12" single released in 1989 -- and only a year after their debut album, Ska Para Toujou, dropped, the group emerged from Tokyo's underground scene to play Japan's most prestigious venue, the Budokan in Tokyo, to a crowd of 10,000. By 1993 Asa-Chang departed, which led to a reassessment of the band's working methods, but ultimately ensured Ska Para's longevity. From now on, all members would take a role in arrangement and production. The change was also necessitated by the death of the band's flamboyant frontman, Cleanhead Gimura, in 1995. Original drummer Tatsuyuki Aoki died in 1999. Despite the upheavals, Ska Para released arguably their best album, Full-Tension Beaters, in 2000, on the Avex label. The album became the group's debut European release and a tour there soon followed, in which the band raced through 11 shows in 12 days. 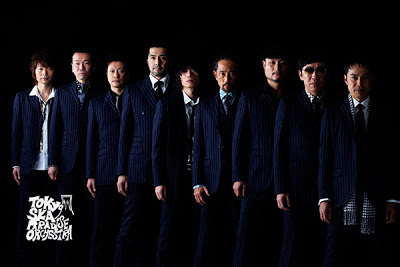 In between the 2002 release of the number one album Stompin' on Downbeat Alley and High Numbers, the successor to Downbeat Alley released the following year, Ska Para played their biggest headlining show to date to 15,000 fans at Yokohama Arena. They would go on to play to many more thousands at the Glastonbury and Eurockeennes summer festivals. In 2004, they became the first Japanese act to play the Bonnaroo music festival, held in Manchester, TN, following this up with a North American tour and a third tour of Europe, including sold-out shows in Barcelona and Madrid and a performance at Denmark's Roskilde festival. As if it were needed, vindication for a career of spreading the ska gospel came in 2006 when Tokyo Ska Paradise Orchestra recorded with one-time Specials member Rico Rodriguez on the trombonist's Japan-only album Japa-Rico -- proof that it wasn't only Dennis Bovellwho was making time for Japan's favorite ska practitioners.